My next newbie freezing question was "How do I freeze food?" With pesto, tomatoes, applesauce, and a few other things, freezing is as simple as throwing the food in a bag and putting it in the freezer. 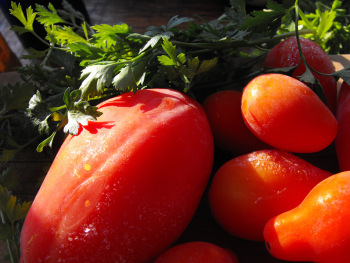 But you'll want to blanch most vegetables prior to freezing. After blanching, you need to cool the food as quickly as possible. Most folks submerge their vegetables in a basin of ice water, but we have limited drinking water and ice, so instead I just lay the vegetables out on cookie sheets and place them in the fridge's freezer for a few minutes before putting them in their freezing container. Once you get the hang of it, it's pretty easy to get a rhythm going where you always have two cookie sheets of vegetables cooling while you're steaming a third set. Blanching time varies by type of vegetable. 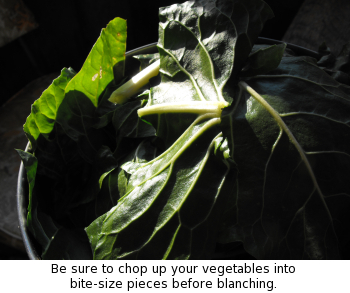 This site has a list of blanching times for most vegetables. Keep in mind that if you're cooking the vegetables into a sauce, soup, etc., you won't need to blanch. How do I freeze food?